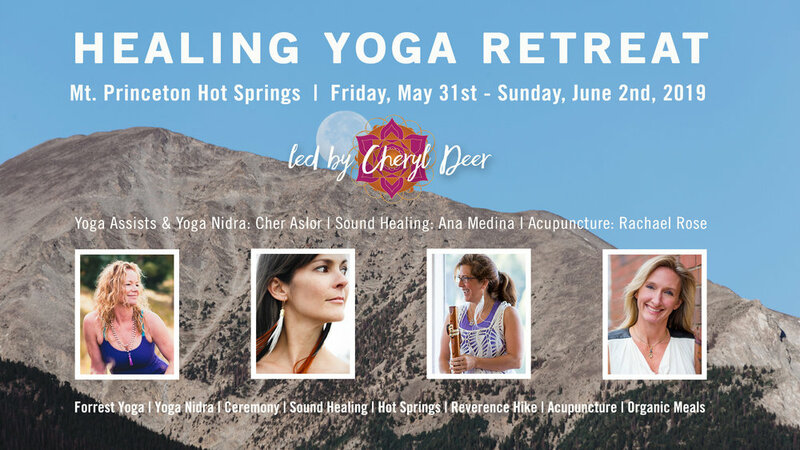 Join us for our annual retreat to Mount Princeton Hot Springs for a weekend of community, ceremony & self-restoration. This year, we are interweaving all of our favorite healing modalities--forrest yoga, yoga nidra, sound healing, acupuncture, hiking, healthy food & mineral soaking--so that we can bring our bodies, minds & spirits back into a place of alignment. As we are infinitely connected to all that surrounds us, the healing we embody on this retreat extends far beyond ourselves; the work we do here helps to nourish all of our relationships, including our relationship with the earth, and empowers our ability to give back. Located in Nathrop, Colorado between the towns of Buena Vista and Salida, Mt. Princeton Hot Springs Resort is an ideal spot for a yoga retreat and getaway to the beautiful Arkansas River Valley to immerse yourself in nature. In addition to the planned retreat activities, enjoy the hot springs, spa services, juice bar and other outdoor activities throughout your stay! Taught over nine full days, this course is open to yoga teachers from any yoga school or lineage and graduates of the Forrest Yoga Foundation Teacher Training (no minimum years of teaching experience). Participants must have a regular personal practice and be ready to move deeper within themselves and assist their students in the discovery of the physical, emotional and spiritual benefits of yoga. We expect you to have the willingness, health and strength to commit to 100% of this teacher training. You will receive a letter of completion only upon 100% completion of the teacher training..
Ana Forrest designed this program to be highly experiential. The training includes chanting, pranayama, intensive yoga practice, working with injuries, addressing the needs and challenges of students, mentoring your own practice and needs, and learning the principles of class sequencing for advanced poses. You will also be taught how to work with students at different levels and abilities and with different body types. The total tuition for this Forrest Yoga Advanced Teacher Training is $2,450. That amount includes the core curriculum, but does not include food or accommodations. A deposit of $1,200 is due upon registration if you do not choose the Early Bird Tuition. The remaining $1,200 is due 30 calendar days prior to the start of the Training, or when the Training becomes full. Your spot in the Training is held only upon receipt of your deposit and is guaranteed upon receipt of your full payment. 10% for military personnel including Active Duty, family members, retirees and veterans. Military ID required (applies also to Early Bird). $300 for repeat students, that are not members of the Hoop (applies on the standard tuition only). Experience this brand new opportunity to practice a blissful yoga practice and Ceremony with Ana and Jose, without taking the teacher training program. Join them, and their teacher trainees every morning for a full immersion into Ceremony and a 3.5-hour Forrest Yoga class that will ignite your Spirit and set you up for the rest of your day. If you're planning on taking the Forrest Yoga Advanced Teacher Training but would like to know a little bit about it first, let these sessions act as a little teaser for you. The morning sessions are open to yoga teachers and experienced yoga practitioners of all yoga styles. You can choose to either book single days for $120 each day or the full 9 days of the training, $1900 for all sessions. To book day 8 and 9 you must have participated in one or more of the previous days of the morning intensives. This workshop begins with a short, yet very special Ceremony of song, dance & smoke blessing. Ana & Medicine Man, Jose Calarco set the intent for the practice and honour those taking part, the ancestors and custodians of our sacred land. Take a physical and mental journey deep into the core of your own being, where you will create a heightened sense of awareness through breath and asanas. Open to the amazing quality of feeling that lives inside as you sweat, breathe and enter into the incredible mystery that is your core. This workshop begins with a short, yet very special Ceremony of song, dance & smoke blessing. Ana & Medicine Man, Jose Calarco set the intent for the practice and honor those taking part, the ancestors and custodians of our sacred land. Learn the magic of heart-opening asanas. Open your core, which gives your heart support and counsel of your other primary chakras. This helps your heart and Spirit be more resilient, flexible and adept at surfing emotional waves. Learn to remove obstructive shielding from your heart so it can truly and honestly feel each new experience afresh. Rekindle the fires of passion and pleasure with Forrest Yoga. Reconnect to your energy and delight in your strength. Bring healing and inspiration into your personal practice. Exhilarating and Delicious. Assisting our students is one of the most powerful ways to create meaningful connections that facilitate healing and transformation. Moving our students in a supportive way requires practice honing and developing our assisting and intuitive skills. Learn assists that range from verbal coaching to physical movement and how to administer them with mindfulness, empathy and compassion. We all have intuition, and the more free and clear our energy channels are, the more we can recognize it. When we are tense or full and our energy pathways are clogged, we cannot feel the messages our bodies are trying to express. At this workshop, we will work on clearing up what is clogging the body in order to receive stronger messages of intuition. Our yoga practice can help wash away old, stuck energy patterns, toxins, stress, and tension, thereby creating space in our bodies, so that we can more easily listen to, trust, and follow our intuition. The power of healing is already within us. In order to tap into this inherent energy, we must unclog stuck pathways, release tension, find compassion for ourselves, forgive, and let go. Through yoga postures and breathing we can begin to soften, open up to feeling and sensation, and bring awareness to areas of the body that need healing. In this workshop, we will learn how our tensions might be connected to experiences in our lives, and how to release these tensions and allow personal evolution to occur. Join us—Cheryl Deer & Cher Aslor—for a uniquely fulfilling, and wholly nourishing retreat to the beaches of Troncones, Mexico. "I believe in the healing powers of this land that we will be visiting," says Cheryl. "I have been there before and experienced opening and ease." Completely unplugged, you'll have the chance to let the chaos of everyday life slip away, while the rhythm, scents, and subtle sounds of the ocean draw you into a state of total relaxation. Imagine the way all the usual sounds disappear when you go fully under water, head submerged, heart immersed in the sensation of surrender. Creativity and growth can arise when we allow the “shoulds” and to-do lists to fall away. Through dynamic daily Forrest yoga practices, Pilates, yoga nidra, swimming, surfing, strolling & journaling, you will have the invaluable opportunity to connect your mind, body and spirit back to Mother Earth. You'll learn to honor the four directions as individual parts of the self, and to re-discover your own sense of spontaneous flow. Together, we'll deepen our knowledge of pranayama, meditation & the self, so we can act to embody the changes we've each been longing to make. Ceremony, laughter, spontaneity, flow, good healthy food, and community, will be our medicine at this weeklong oasis of awakening. Through deep connection with spirit and each other, you will go home better able to walk in your highest purpose—and to help your friends and family do the same. “When we retreat, we are reminded of what’s already inside us—space, breath, joy,” says Cher. If this sounds like something your mind + body + soul has been longing for, you belong in Mexico with us! Click here for photos and full details! Exploring your personal mysteries can be challenging, but the rewards are great. Through focused breath work and asana we will learn how to work with these blocks and patterns to free up space for prana to flow. Come discover how movement feels with greater ease and comfort as you walk through your life with freedom and grace. Resistance to intensity creates pain, anxiety and a whole gamut of other emotions that pull us off center. However, flowing with the intensity allows us to watch and feel our emotions pass through us without affecting our equanimity. We will build our ability to stay in intensity rather than fight against it. This skill helps us to stay present and open in challenging situations. Are you ready to join the next level of yoga teachers? Become a 500-RYT through Samadhi’s 300-hour Advanced Teacher Training, Embody Samadhi. We have crafted this professional development program in order for you to have greater expertise into the science of yoga. You will be mentored by Denver’s top instructors including Cheryl Deer, Jeremy Wolf, Hansa Knox, Kristine Whittle, Santosh Powell Brittany Belisle and Alejandro Morin. This yoga teacher training is advanced not because you dive deeper into asana, but because you go deeper into your path as a teacher. You’ll develop advanced understanding of teaching techniques beyond guiding asana. Why Choose Samadhi’s Advanced Program? Don’t just memorize concepts, tricks, and techniques—Embody Samadhi. Samadhi Yoga Denver is honored to have top teachers designing, leading, and refining our 300 hour program. Additionally, we humbly host national teachers each year so that our 300 hour students can experience the highest level of instruction. Our yoga teacher training focuses on teaching practice and development. You will lead community classes, receive one on one feedback from your teachers, and focus on the development of your personal practice and relationship to yoga. Lead teachers of our Advanced Teacher Training are deeply rooted in lineage. Samadhi brings in teachings from Rod Stryker, krishnamacharya, Thich Nhat Hanh, Anna Forrest, Bihar School, B.K.S. Iyengar, and Tias Little along with more. Our advanced teacher training i is meant to be a program that fits your path as an individual. You can finish the program in as little as one year, or take up to three years. You are able to craft the concentration of the program through the electives you choose to take, this allows you to get the most value out of the program for where you want to take your teaching. The core strength of the advanced teacher training program is that our students are supported to deeply inhabit the fundamental values and teachings of yoga as a time-tested way of life. While our content is rich and varied, we feel that the most powerful way to affect the world is to transmit the energy of the practice. What we will not do is consume yoga as just another commodity. We know that yoga is sacred and we aspire to keep it that way. Yoga enables us to build a deeper connection with all that is: our oneness with nature, self, spirit, and others. Imagine yourself fully present, slowing down in nature, being nourished on many levels, breathing deeply, and feeling the aliveness all around you. By tapping into this experience, we can be more present in our yoga practice, and connect more deeply to ourselves and our breath. Breath IS spirit, breath IS our very presence, consciousness, ability to be here in this life; it is our aliveness. We will use the postures and breath to open the energy pathways, allowing us to relate to the world and others in a more wholehearted way. Location: Samadhi Center for Yoga, when going to link below, search for Cheryl Deer in Instructors to find event. We can be nourished on many levels: physical, mental, emotional, energetic, and spiritual. When we go into situations with more receptivity and without expectations of accomplishing some goal, there’s more space for us to be nourished. For many of us, it requires a paradigm shift to recognize that our life experiences are potent possibilities, and we can learn to choose experiences that nourish rather than deplete us. When we are nourished, we can operate from a place of wholeness and give back in a more authentic and enthusiastic way. See more detailed times on the Samadhi Website below. This module is designed to help you find your authentic voice and method as a yoga teacher and to further develop your healing and teaching skills. Trainees will be teaching more advanced yoga postures and sequencing, and learning how to apply these practices to students of all levels and range of injuries. The yoga intensives are taught in a way that leads to deeper knowledge of yourself and how to create more freedom by connecting to the power of truth, compassion and healing. The training will include chanting, meditation, pranayama, three-hour advanced yoga practice that includes learning hands-on assists, sequencing, teaching to all levels, healing and connecting to spirit through ceremonial truth speaking. Location: Samadhi Center for Yoga - To register below, once you get to the events page, select Cheryl Deer as Instructor and this event will display. Samadhi Yoga Denver’s Teacher Training is one of the most respected Teacher Trainings available in the Denver area. Over the years, Denver’s top instructors have refined the Samadhi Teacher Training into a comprehensive program resulting in well trained, engaged, and embodied teachers and serious practitioners. Throughout the training, you will engage with and become part of Samadhi’s family of heart-centered yogis, creating lifelong connections. Together we will hone the skills of full presence, service, joy, truth, and healing of ourselves, our students, and the culture at large. Samadhi Yoga Denver’s 200 Hour Teacher Training is a Yoga Alliance Certified Yoga School, and upon graduation you will be able to apply for a 200-RYT through Yoga Alliance. For more information on certification, visit the Yoga Alliance website. Jeremy Wolf — Teaches Philosophy, Subtle Body, Energetics, Yoga Nidra & Asana. Kristine Whittle– Leads all Anatomy and Physiology sessions, as well as the Cadaver Lab portion. Saraphina Mesmer — Teaches Bhakti Yoga, Meditation, Mantra, Pranayama, & Sequencing. Participate in the entire weekend of immersive study with Ana Forest. Ana Forrest has been changing people’s lives for nearly 40 years. An internationally recognized pioneer in yoga and emotional healing, Ana created Forrest Yoga while working through her own healing from her life’s trauma and experience. With thousands of licensed practitioners around the world, Forrest Yoga is renowned as an intensely physical, internally focused practice that emphasizes how to carry a transformative experience off the mat and into daily life. Plagued with back pain? Revitalize and strengthen your back. Stimulate healing by learning how to bring fresh oxygen, blood and nerve energy into your back and torso. Forrest Yoga teaches poses created specifically to heal and strengthen your back. Work, sweat and attain freedom from back pain. Inversions and arm balancing poses are challenging and exciting. They rejuvenate the mind and body. They increase circulation of blood, oxygen, and energy, stimulating the endocrine and immune systems. Both arm balancing poses and inversions develop mental and physical strength, balance and flexibility. 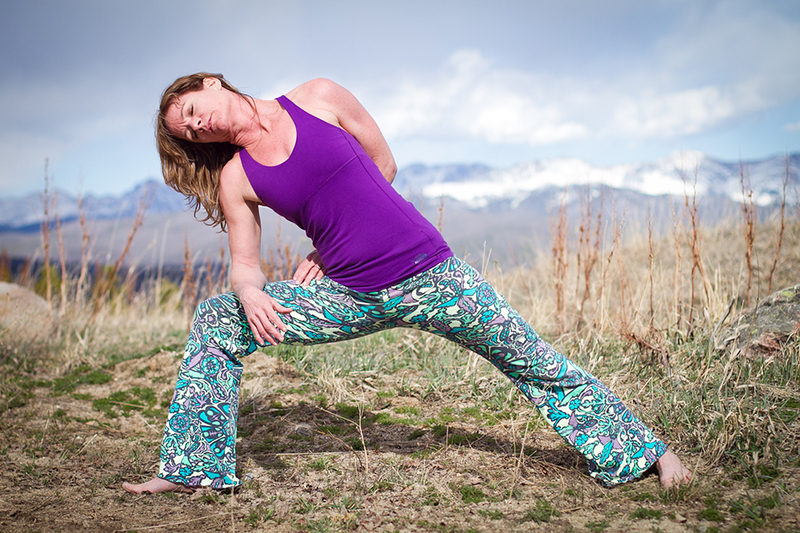 In this session, learn the essential elements of these powerful poses. Learn the skills of balance and then have fun applying them to your life. Intermediate/Advanced NOTE: This session is not appropriate for pregnant woman or those with detached retinas, or wrist or arm injuries. Join Cheryl Deer and Annette Scott to learn how to take your teaching deeper. Learn the art of giving hands-on adjustments. Embody confidence, develop your intuitive skills and gain depth as a teacher. Deepen the connection you create psychologically and spiritually with your students through distinctive, personalized physical adjustments. Learn assists that range from verbal coaching to physical movement and how to administer them with mindfulness, empathy and compassion. Learn to skillfully guide students into proper alignment while experiencing a more profound and empowering connection to their own body. Increase your depth as a teacher as you learn to tune into your students and “see” their alignment needs. Learn tools to help develop your intuition and teaching intelligence so that you are able to discern whether an adjustment serves the student’s highest good. Continue to set safe personal boundaries while remaining connected so that you can continue to develop the trust between you and your students. Come and learn how to safely assist, heal and empower others. For more information on the weekend breakdown please click on more info. Please sign up to reserve your place as space is limited. Explore The Benefits of a Yoga Lifestyle, Experience FIRST HAND a quantification of HOW YOGA WORKS! 2) guide their students with the purpose of serving their students’ goals toward finding deeper awareness and a fuller life. Registered with The Yoga Alliance, The Seva Teacher Training is a completely unique, refreshing and modern Hatha-Vinyasa training. Upon completion of the entire course, trainees will walk away with the tools they need to teach alignment based-Hatha-Vinyasa Yoga and teaching principles that apply to many forms of Hatha Yoga. At that point, trainees are eligible to register with the Yoga Alliance as a 200-hour certified yoga instructor. I am super honored to be a part of the first annual Denver Yoga Festival. Their mission is to "create a community for everyone who is interested in yoga, mindfulness, and meditation, while also acting as a springboard for the careers of incredible yoga professionals." "We are really excited to be offering experiences that are not a part of a traditional yoga festival, combining our favorite things about city life into our yoga program. Along with asana, lectures and mediation, we have authentic and unique experiences like yoga brunch, tea time and meditation, yoga on Coors Field, FREE kids camp, outdoor adventures, panel discussions on the state of yoga, yoga fashion show, vendor spotlights on health & wellness, live music & dance parties..."
The festival will take place at the historic Oxford Hotel and plaza of Union Station. The entire event is completely walkable and have both indoor and outdoor venues to practice and play. Unraveling the Mysteries of Your Neck, Shoulders, and Hips. Exploring your personal mysteries can be challenging, but the rewards are great. Through focused breathwork and asana we will learn how to work with these blocks and patterns to free up space for prana to flow. Come discover how movement feels with greater ease and comfort as you walk through your life with freedom and grace. -Increase stability and range of motion in the hips, neck and shoulders. -Gain awarness of mental and emotional blocks in the body. -Lower your risk of injury and reduce any discomfort in the low back and neck. This class utilizes the Pogamat Massage Ball and each student will receive a free massage ball to take home. The Samadhi Yoga Teacher Training and Living Yoga Immersion programs are two separate programs that are for those who are committed to uncovering truth and devoted to working to better the world we live in through yoga. The Samadhi program is of the highest quality and most respected that we know of. One of our many strengths is that the program is eclectic, offering many different styles and teachers with a strong commitment to helping students find their own authentic voice. Samadhi is a small, privately-owned center deeply committed to the spiritual core of yoga practice as a powerful living tool for transformation and healing. The Samadhi program will challenge you on every level and leave you transformed forever. The Samadhi Yoga Teacher Training consists of over 200 hours of in-depth study and experience and will cover the following material. We all have intuition, and the more free and clear our energy channels are, the more we can recognize it. When we are tense or full and our energy pathways are clogged, we cannot feel the messages our bodies are trying to express. At this workshop, we will work on clearing up what is clogging the body in order to receive stronger messages of intuition. Our yoga practice can help wash away old, stuck energy patterns, toxins, stress, and tension, thereby creating space in our bodies, so that we can more easily listen to, trust, and follow our intuition. Challenge your perspective on the things that pull you down by defying gravity and balancing on your hands. In this intensive you will learn the fundamentals of how to lift off, surf the air and land lightly with grace. Note: This workshop may not be appropriate for people with heart problems, detached retinas, ear problems, wrist or arm injuries or pregnant women. The power of healing is already within us. In order to tap into this inherent energy, we must unclog stuck pathways, release tension, find compassion for ourselves, forgive, and let go. Through yoga postures and breathing we can begin to soften, open up to feeling and sensation, and bring awareness to areas of the body that need healing. In this workshop, we will learn how our tensions might be connected to experiences in our lives, and how to release these tensions and allow personal evolution to occur. The multitude of feelings like panic, frustration, anger, pain, and sadness experienced in twists might just be the emotional content that is sitting in your cell tissue ready to be wrung out. We will explore the stimulating and detoxifying effects of twists and bask in the silence left behind. You will leave profoundly present and peaceful. Cultivate authentic freedom with your relationship to love by creating space in the spine and heart. Through back bending movements, we can open up the flow of healing energy in these parts of your body. This enables us to explore the possibility of love existing without fear or entanglement.